- PLANT A TREE: What the world needs is more trees! With the amount of trees being cut down and used for paper products every day the earth could use some more lovely trees! So, gather your family, take a hike in the woods and plant a seed. And this gift keeps on giving! Try to visit your tree each year and watch it grow! - ARTS & CRAFTS: To satisfy the environment and your loved ones use recycled paper or cardboard and non-toxic paint to create the perfect Valentines Day Card! Not only will you save money, but the earth will love you right back for this choice! - COOK WITH LOVE: When making that romantic Valentine’s Day meal, choose organic. Processed food is not only unhealthy for YOU but the pesticides used and other artificial foods are not sitting well in the earth’s stomach! Stop by your local Whole Foods or organic section of the grocery store to find delicious, healthy ingredients good for you AND the earth! We’re proud to make the Earth our Valentine and continue to love her all year long by recycling 80% of the waste collected! We look out for the environment so you and your loved ones can live long, happy and healthy lives! 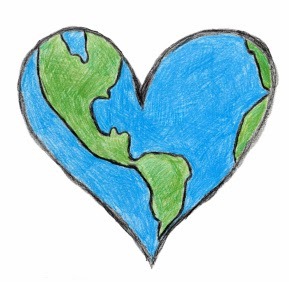 Tell us what you did for the Earth this Valentines Day on our Facebook page or in the comments below! Make 2014 Your Best Year Ever!